Joining in AVAST’s fight against malware, is a team of helpful minions with fanciful names like Zilch, Kobayashi , and Torque that clean and tune up your computer’s system of unwanted grime. These are not the bumbling underlings of a wannabe super villain, rather they are a well-trained army, led by studly Officer Pete. This elite group, from newly acquired Jumpshot, removes “Grime” like trialware, pop-ups, bloated toolbars, and junk files that slow down your PC’s performance. Jumpshot’s optimization technology is slated to become available to all AVAST users around the winter holiday season – just in time to get rid of the annoying pre-packaged software on brand new Windows computers. Jumpshot’s fully-automated solution to PC troubleshooting can also make sluggish computers run like new again. Using simple one-click activation or a minion-styled USB stick, each minion explains its specific task, providing friendly and easy-to-understand feedback on the clean-up work they have done. “AVAST’s and our vision fit perfectly together -- providing our customers with easy-to-use yet effective security, to maintain a smooth computer experience,” said David Endler, CEO of Jumpshot. Please join us in welcoming the good folks at Jumpshot. 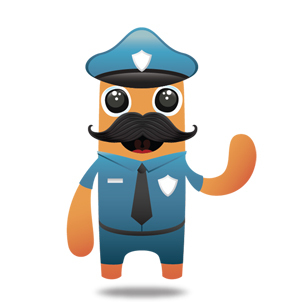 And be on the lookout for announcements from Officer Pete and the rest of the minions in the coming months. Visit Jumpshot’s website to learn more about their history, the minions, and the technology behind it all. Read the official press release.